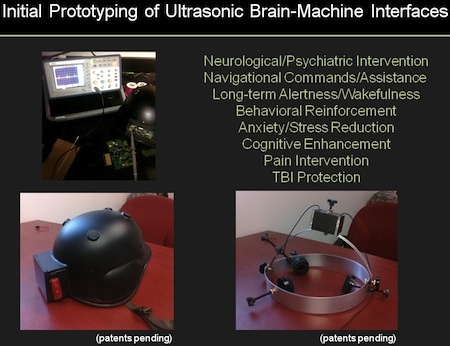 Ultrasonic control of brain activity at Arizona State University has been supported by DARPA; a prototype device that does not require surgery has been created that allows for remote control of brain activity. [Dr. William J. Tyler of the School of Life Sciences at Arizona State University] has engineered a novel technology which implements transcranial pulsed ultrasound to remotely and directly stimulate brain circuits without requiring surgery. Further, we have shown this ultrasonic neuromodulation approach confers a spatial resolution approximately five times greater than TMS and can exert its effects upon subcortical brain circuits deep within the brain. How will this technology be used to provide an advantage for American Warfighters? Potential applications include behavioral reinforcement, anxiety and stress reduction, cognitive enhancement and long-term alertness and wakefullness. "Naturally. It's an artificially evolved telepathic metazoan. And with it, Wright solved the basic problem of modern times: the existence of diverse, warring ideological factions, the presence of disloyalty and dissent." See also this earlier article on Optogenetics - Fiber Optic Brain Control and Remote Control For Humans. Read more at Defense Media Activity.